Inositol is a small molecule structurally similar to glucose. Inositol usually refers to myo-inositol, which is a vitamin-like compound (pseudovitamin) that forms a component of cell membranes and is involved in cellular signaling. There are nine different inositol stereoisomers of which myo-inositol is the most common and most well-understood form. Myo-inositol shows the most promise as a dietary supplement for promoting female fertility, restoring insulin sensitivity in those with Type II diabetes and polycystic ovarian syndrome (PCOS), and for anxiety reduction. Due to the mixed benefits to insulin resistance and fertility, myo-inositol is considered a good treatment option for women with PCOS. Inositol is approved as a dietary supplement component under provisions of the Dietary Supplement Health and Education Act of 1994. It is a very safe supplement to ingest, and all side-effects associated with myo-inositol are merely mild gastrointestinal distress from high doses. There are limited robust scientific studies looking at the effect of inositol on cognition in normal people. It is an area with huge potential for research. A 2001 study observed the effects of an energy drink blend (1 g taurine, 600 mg glucuronolactone, 80 mg caffeine, 5.25 mg glucose, 21.5 mg sucrose, 50 mg inositol, 20 mg niacin, 5 mg vitamin B6, 5 mg vitamin B5, 1.5 mg vitamin B2 and 0.005 mg vitamin B12) on mood, memory and information processing. It found no signficant effect on short-term memory (as measured by the delayed word recall task), but there were positive effects on mood and attention1. One study in 2001 observed the effects of an energy drink blend (1 g taurine, 600 mg glucuronolactone, 80 mg caffeine, 5.25 mg glucose, 21.5 mg sucrose, 50 mg inositol, 20 mg niacin, 5 mg vitamin B6, 5 mg vitamin B5, 1.5 mg vitamin B2 and 0.005 mg vitamin B12) on mood, memory and information processing found that there was a significant effect of inositol on mood as measured by the Bond-Lader scale. The participants that took the energy drink blend reported values on the Bond-Lader scales that were skewed towards the positive attitudes1. The 2001 study saw a significant effect of inositol on attention as measured by the rapid visual information processing task1 . Inositol is found in various foods. The foods that contain inositol include: citrus fruits, beans, cantaloupe, lecithin (e.g., from sunflower seeds, soy, eggs), bananas, kiwi, peaches, pears, cabbage, okra, tomatoes, eggplant, pumpkin, bell peppers, potatoes, carrots, whole grains, fish, and breast milk2. 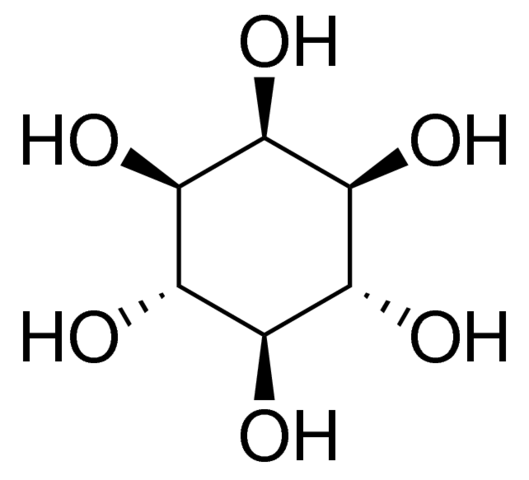 Inositol can be synthesized in the lab from glucose (see figure below). The synthesis can be conducted in yeast3. Inositol is taken up into tissue via a sodium-dependent inositol co-transporter. This co-transporter also mediates glucose uptake, which means it can competitively inhibit inositol uptake. In human neural tissue, myo-inositol is around 3.93+/-1.13mM in youth and 4.69+/-0.69mM in older subjects. Trials have shown that inositol has effective anti-anxiety properties on par with RX-only fluvoxamine for reducing anxiety and panic symptoms.